« In Which We Begin the Year With a Horny Old Goat. 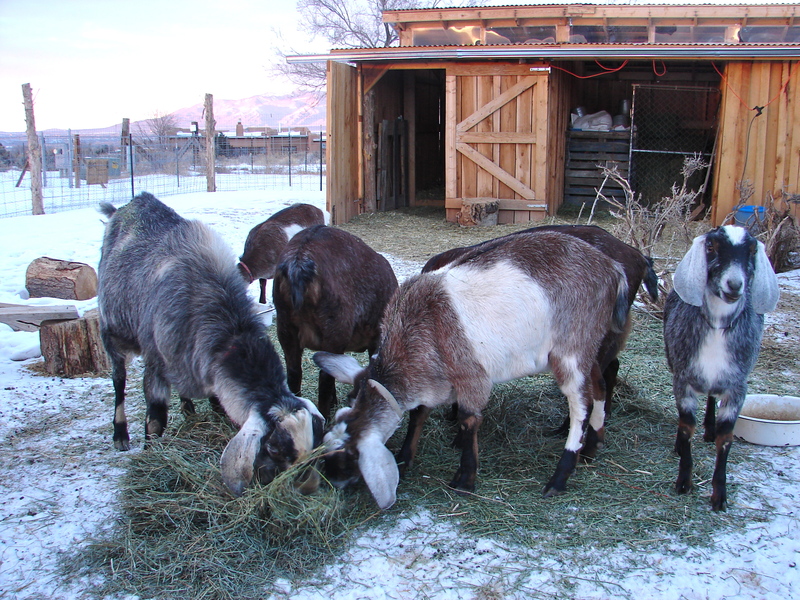 I realize I said my next farm to-do item was harvesting Bucky, our meat goat we raised since last spring. But we must roll with the punches of farm life, eh? Last night my farmer friend called requesting to bring over his 2 doelings. He was anxious to get them in on some of the hot action of the royal boudoir. And less than 24 hrs later – here they are! Katniss (gray and black – the screamer of the twosome), and Prim (brown and gray, the quieter of the two). 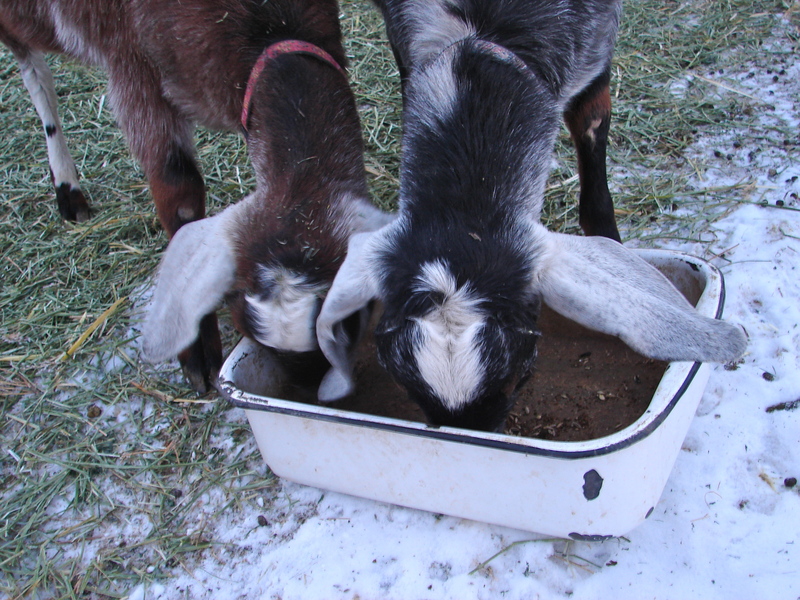 Meet Katniss and Prim, close relatives of my own goats and pre-empters of their kinsman’s fast approaching demise. Prim is, in fact, our Bucky’s sister, and Katniss is half sister to Fiona, Bucky and Prim. And Hazelnut is auntie to Bucky, Prim and Katniss, and mama to Fiona. I know, caprine kinships can sound a bit like the genealogical archives of a West Virginia Appalachia mountain family. But the important thing to keep track of is that King Arthur is no one’s Uncle Daddy. “But he IS, ah, Katniss’….. grandpa,” informed Chris with a concerned look in his eye. We both shifted our weight from one foot to the other, finding great interest in a passing magpie. Chris rubbed the stubble of his red beard thoughtfully. Just back in from evening feeding and putting to bed our suddenly doubled herd. The new doelings are crying like they’re being led to slaughter, and perhaps deflowering is not too far off the mark. But I know the painful mourning is for their mothers from whom they have never been separated, before tonight. Poor little nuggets. I sat on a play stump for some cuddles which Katniss and Prim lost no time in taking advantage of. Their knobby, little heads thrust strongly under each of my arm pits, trying together to topple me off the stump backwards. I regained my balance ungracefully to a snotty, royal snort in my face from the massive head of King. I’ve got to admit I am finding a fond spot in my heart for that stinky, old fellow. His massive back is at such a convenient height for petting, something that ranks high on the likability chart once you’ve turned 50. I also have to admit I like the additional barnyard members. It helps to satisfy my insatiable mommy need to take care of creatures. I like the rush of fur and lips, the tasting of my gloved fingers, the nibbling on the string of my hood, pushing and leaning for attention, the smell of alfalfa hay on snow, and the warmth of unconditional, furry love. Lots and lots of love. It surges between us like the ebb and flow of the ocean tides…. love out… love in… love out… love in…. Like the soft, milky breath of a newborn kid. The new improved herd, 50% larger and more absorbent (of grain and hay and water anyway)!